Regiment/Catrawd: 79th Battalion, Canadian Infantry. Service Rank and Number / Rheng gwasanaeth a rhif: Private. Military Cemetery/Memorial / Fynwent milwrol: Brandon Cemetery, Manitoba. Ref No Grave or Memorial / Rhif cyfeirnod bedd: S:16. B: 'C'. L: 40. Country of Cemetery or Memorial / Gwlad y fynwent neu gofeb: Canada. Accidently drowned whilst on a bathing parade with the Battalion on 12 August 1915, aged 21 years. Albert Williams was born in 1895 in Rhyl, Flintshire, North Wales. The 1901 Census shows that the family lived at 14 Morfa Bach, Rhyl, Flintshire. The head of the family was Sarah Williams (nee Pugh) a Widow and her two children – Albert Williams Aged 6 and Peter Williams aged 4 years. By 1911, he was a boarder at 12 Church Street, Rhyl, Flintshire and employed by the owner of the property a Mr. James Barratt, a Milk Purveyor. On 6 May 1913, Albert emigrated to Canada and sailed from Liverpool to Quebec, Canada on the White Star Dominion Line arriving there on 14 May 1913. 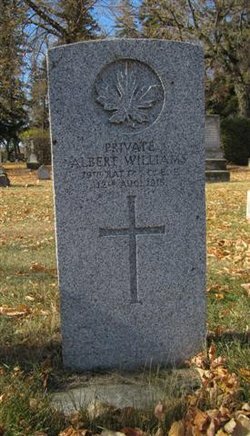 Private Albert William’s headstone, Brandon Cemetery, Manitoba, Canada. Albert’s name is also commemorated on Page 41 of Canada’s First World War Book of Remembrance. He is also remembered on The North Wales Heroes Memorial Arch, Deiniol Road, Bangor, North Wales and on a Remembrance Plaque at The Royal Alexandra Hospital, Marine Drive, Rhyl, Flintshire.